Top 10 blog traffic tips. Learn how to get more traffic to your blog or website with these tips and techniques. 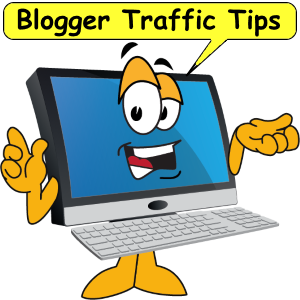 Blog traffic tips to improve traffic to your blog or website. In every bloggers life comes a special day - the day they launch a new blog. Now unless you went out and purchased someone else's blog chances are your blog launched with only one very loyal reader - you. Maybe a few days later you received a few hits when you told your sister, father, girlfriend and best friend about your new blog. But that's about as far you went when it comes to finding readers. Here are the top 10 blog traffic tips bloggers can use to find readers. These are tips for all bloggers who have next to no audience and want to get the ball rolling. 10. Write at least five major "pillar" articles. A pillar article is a tutorial style aimed at teaching your audience something. Generally they are longer than 500 words and have lots of very practical tips or advice. This article you are currently reading could be considered a pillar article since it is a good "how-to" lesson. This style of article has long term appeal, stays current and offers real value and insight. The more pillar articless you have in your blog the better. 9. Write one new blog post per day minimum. Not every post has to be a pillar article. You should work on getting those five pillars done at the same time as you keep your blog fresh with a daily news or a short blog post. The important thing is to demonstrate to your visitors that your blog is current. Make them feel that if they come back tomorrow they will likely find something new. This encourages visitors to bookmark your blog or subscribe to your rss feed. You don''t have to produce one post per day all the time, but it is important you do so when your blog is brand new. Once you get traction you still need to keep posting fresh content often. Your loyal audience will be more forgiving if you slow down after a while. The first few months are critical, so the more content you can produce the better. 8. Use a proper domain name. If you are serious about blogging be serious about what you call your blog. In order for people to easily spread the word about your blog you need a easily memberable domain name. People often talk about blogs they when they are speaking to friends in the real world. You need to make it easy for them to spread the word and pass on your URL. Try and get a .com domian name if you can. Focus on small easy to remember and have the correct keywords If you can get great keywords and an easy to remember domain name, then you have done a good job. 7. Start commenting on other blogs. Once you have your 5 pillar articles and your daily fresh posts your blog is ready to be exposed to the world. One of the best ways to find visitors for your blog is to comment on other people's blogs. You should aim to comment on blogs focused on a similar niche topic as yours. Then readers will be more likely to be interested in your blog. Most blog commenting systems allow you to have your name/title linked to your blog when you leave a comment. This is how people find your blog. If you are a prolific commenter and have something valuable to say, then people will be interested to read more of your work and click through to visit your blog. Blog traffic tips 6. Trackback and link to other blogs in your blog posts. A trackback is sort of like a blog conversation. When you write a new article to your blog and it links or references another blogger''s article you can do a trackback to their entry. What this does is leave a truncated summary of your blog post on their blog entry - it is sort of like your blog telling someone else's blog that you wrote an article mentioning them. Trackbacks often appear like comments. 4. Include social media links in your blog. This blog traffic tip is very important. Use FaceBook and Twitter or your favorite social media outlet to promote your blog. Let all your friends and followers know about your blog by creating a business page in FaceBook. While it is possible to connect your blog directly to FB I don't recommend it. It is best to write unique FB posts about your blog and link to it that way. Include social media buttons on your blog or website. But do not use every social media outlet there is. Pick your top 3 favorites and only use those. You don't want several possible duplicate content sites out there. 3. Submit your blog to Blogarama. To be honest these blog traffic tips are not going to bring in a flood of new readers. But, it is so easy to do and only takes five minutes, so it is worth the effort. Go to Blogarama, find the appropriate category for your blog and submit it. You have to copy and paste a couple of lines of code on to your blog so you can get listed. Then sit back and watch the traffic come in. You will probably only get 1-10 incoming visitors per day with this technique but over time it can build up as you climb the rankings. It all helps! Update Mar. 2018. Blogarama now limits the number of free posts it will publish to 50. After that an upgrade can be purchased. At the time of this writing a 'Pro' or upgraded account costs $100/yr. An upgrade has many benefits including premeir listings, unlimited posts and do-follow links. Which could lead to a flood of new visitors. 2. Submit your blog to FeedBurner This iare more blog traffic tips that may not bring in hundreds of new visitors immediately (although it can if you keep doing it). It is worthwhile because you simply leverage what you already have - your pillar articles. FeedBurner is a blog sysndication service now owned by Google. FeedBurner offers several tools to help improve your Internet presence. It is worth taking the time to go through each tool and see if it is right for you. Blog website tips #1. Write more pillar articles. Everything you do above will help you to find blog readers however all of the blog traffic tips listed only work when you have strong content in place. Without them everything you do may bring in readers but they won't stay long or come back. Aim for at least one solid article per week by the end of the year you will have a database of over 50 feature articles that will work for you to bring in more and more traffic. We hope you enjoyed this list of blog traffic tips. Everything listed above are techniques I've put into place myself. It is certainly not a comprehensive list. There are many more things you can do. Improving website traffic is all about testing to see what works best for you and your audience. Have no doubt if you put these blog traffic tips into action you will improve traffic to your website.